Statue hire, statues, party statues, photography statues, wedding statues, event statues. We will hire and install statues anywhere for events. prophire vast stock of amazing theme statues are ideal for photographic shoots, weddings, table centres, and generally to enhance any venues, parties, and corporate hospitality ocassions. View our Statue Hire image database. 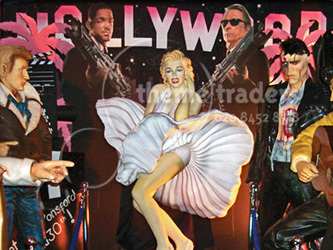 prophire statue hire covers every theme, religious, classical, decorative statues and props, themed to any era and style. Statues can be re painted and customised. Ideal for events, photographers, stylists. Statues can be made to order from our model making department for sale or hire.